Shortly after moving to Brooklyn, I read Happier at Home by Gretchen Rubin. I really loved the book, and fell in love with its quick, easy steps to making yourself happier. I was also particularly comforted by the fact that she says you don't actually have to get rid of things to be happier. She acknowledges that sometimes objects make us happy, and the book is more about making those items work for us than about taking a minimalist approach. One of the projects she mentioned, Cultivate a Shrine, struck an instant cord with me. 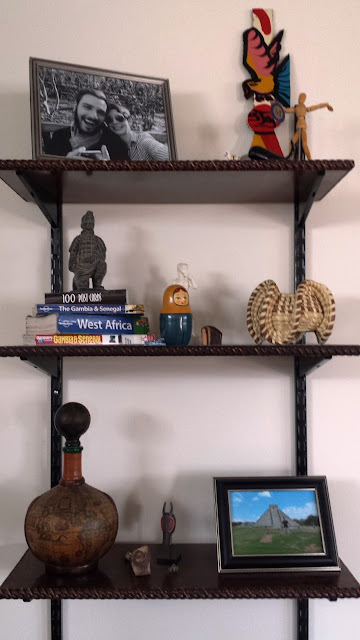 We had space in our office, where we had been planning on putting up the shelves my father had made for our last apartment, but we were stalling on putting them up because we didn't know what to put on them. They'd held office supplies before, but we had a difference space for those now. When I read Rubin's idea about creating a shrine to work in her office, I realized we could start a shrine to our own passion: travel. 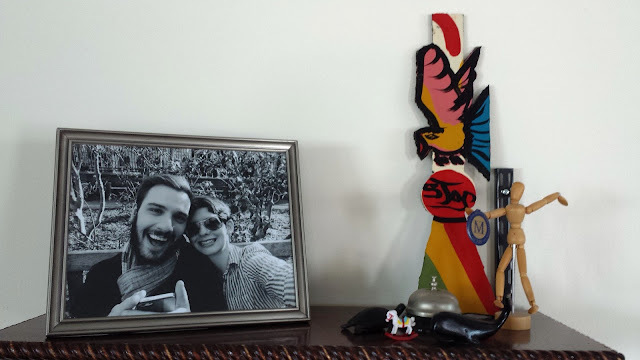 Not only did it make use of the beautiful handmade shelves, but having all of our little souvenirs in one place gives them a purpose, and being together makes them beautiful. Rather than being strewn about the house, they're all in one place and now whenever I pass it, I think of the places I've been and how happy those trips have made me. It was a quick, simple thing to do, but it's really improved my mood for months now. If you have a passion that results in some objects, I'd urge you to build a shrine to that passion by gathering them all in one spot and arranging them to be just a little aesthetically pleasing. You never know how they'll improve your mood when you see them! 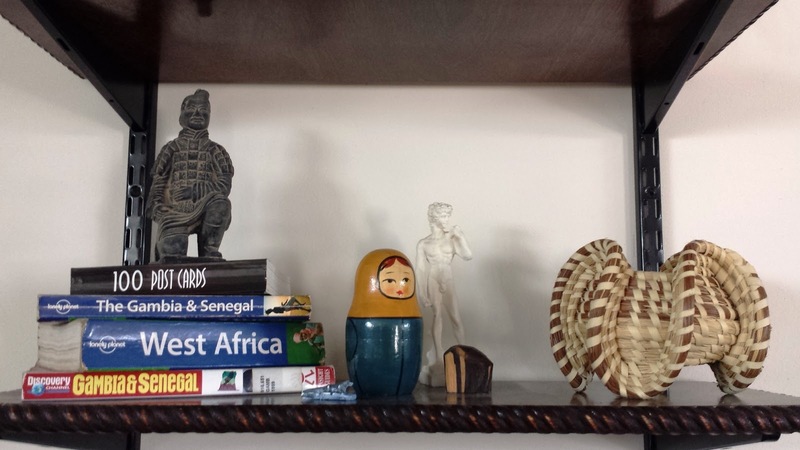 So, what's in our travel shrine? A mixture of things, old and new, from our travels and from the travels of friends and family. Changing out the photos and objects every so often has kept it fresh for us. Here's what we have, from the bottom up. 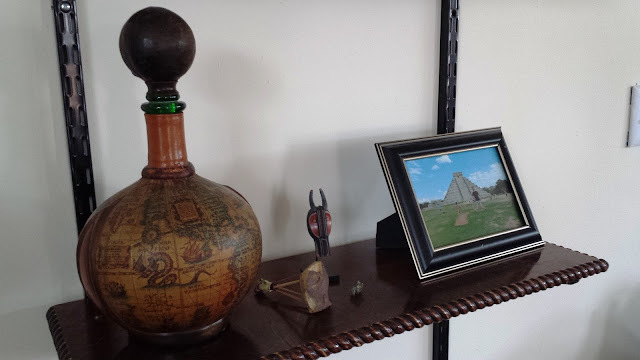 Do you have any shrines in your house? Any passions you want to commemorate? I remember you telling me about this when you were in Denver- how lovely that the mood-brightening effects have lasted so long!